Many professionals are venturing into cryptocurrency from diverse backgrounds. The growing industry is opening an increasing amount of business opportunities and a lot of people are finding that their skills can be put to use in this early industry. But some lack the necessary knowledge to get started and take those crucial first steps. Whether you are looking to work in the industry, participate in the markets, or even just educate yourself about cryptocurrencies, these chapters aim to give you the foundational knowledge needed to get to grips with the cryptocurrency industry and become actively involved. This book is structured into seven chapters which start with a beginner knowledge and advance to more expert investing concepts over its progression. The breakdown of the chapters are as follows. The first chapter introduces the reader to Bitcoin and its history. It also gives an overview of some of the most significant altcoins along with covering key terms that you will come across in cryptocurrency. The second chapter will delve a bit deeper into what exactly cryptocurrency assets are and how they fit into our more traditional idea of markets. The third chapter will delve further into what you need to do to take that first step. It will dive further into different types of exchanges and wallets and provide some walkthroughs. The fourth chapter will be an introduction to investment. We will cover some of the common terms you will come across and also detail the basic concepts to take into consideration. The fifth chapter dives deeper into the details of investment. This chapter will provide readers with information on both fundamental and technical analysis as it relates to cryptocurrencies. The sixth chapter covers advanced trading concepts. The concepts here will include derivatives, short positions, utilizing leverage, and ICO investing. The seventh chapter focuses on putting all the information together into an overall approach. It deals with how you can manage your risk and portfolio theories. It will also discuss the next steps you can take moving forward. As you have probably figured, the chapters work as an overall progression. The goal of the chapters is to get you from little knowledge to understanding some of the more advanced concepts in the market as quickly as possible. As a bonus, at the end of each chapter we will provide some exercises which will help accelerate your learning. These are optional tools and tasks taken from industry practitioners and will serve to give you a deeper knowledge of the industry and also assist you in discovering tools which are going to be beneficial to you on your journey navigating the industry. Over the past few years, Bitcoin has immersed itself in everyday society. With euphoric price increases of over 1000% in 2017, it has succeeded in capturing mainstream attention. Price discussion became a focal point of culture as everyone from bankers, journalists, computer scientists, and everyday workers hotly debated the feasibility of the first-ever cryptocurrency. But high prices were not always central to Bitcoin. Bitcoin was originally designed to tackle much deeper problems. Bitcoin is visually represented with the following icon. An orange circle with striped B similar to the $ sign. In the midst of the last financial crisis in 2008, the paper detailing the Bitcoin project was published. The paper was published by Satoshi Nakamoto. A whitepaper is an authoritative and detailed report which informs it’s readers about a complex issue, defines the problem, proposes a solution and allows its readers to make a decision. To this day, nobody knows who Satoshi Nakamoto is. It could be a man, a woman, or a group of people. The project proposed a peer-to-peer cash system that removed the need for middlemen and intermediaries. The intermediaries, in this case, would be the banks and the reliability on the government. The name for this peer-to-peer cash system is Bitcoin. Prior to Bitcoin there had been many attempts at developing digital cash. However, there was one key problem. If a user has a file on their computer and it is sent to another user, then they will both have a copy of the file. This will not work for money as there is no way of ensuring that the money is not double spent. The way Nakamoto proposed to solve this was to use a distributed technology which made computers in the network expend energy to ensure that the data which represented money was not being double spent. The technology is called blockchain. Put simply, blockchain is an online shared database with certain rules. It is an append-only database which means that data can only be added and once added, it can never be modified again. The data which is added to this database is known as ‘Block’, referring to blocks of data. Since this data can only be added on to the last approved block of the database, it metaphorically creates a chain of data, or a chain of blocks. Hence the derived term ‘BlockChain’. Data is essentially nothing more than a piece of code which performs a certain function or stores particular information. The database is run by a peer-to-peer network. In the normal centralized model, we have one powerful computer which is responsible for maintaining the state of the network. In the peer-to-peer network, all the computers in the network are responsible for maintaining the database (aka the blockchain) up to date. We have established that blockchain is peer-to-peer and is append-only. But let’s delve deeper into what a blockchain really is and what it means for the technology. At the essence of blockchain technology is distributed computing. This means there is no need for intermediaries or middlemen. Although distributed computing takes up far more computational resources due to everyone in the network having to maintain the state of the network, it reduces the need for trust. The network is also set up with certain rules. To change these rules, consensus needs to be reached among the community to update the code. This typically involves a long and arduous process that goes through several technological, social, and political layers. One of the examples of a rule in the Bitcoin network is that the maximum supply that will ever be in existence will be 21 million. The transparent rules of the network make the system censorship resistance. As long as a user complies with the rules of the network, they can participate in the network. It doesn’t matter who they are, their ethnicity, or the nature of the content. As long as the rules of the network are respected, transactions or content will not be censored. Almost all blockchain projects are open-source meaning that their source code can be openly assessed and tested. This has proven to be a robust framework for projects so far as it enables a large community of developers to work on the code and any flaws are quickly spotted and improved upon. How are transactions actually processed? You may be wondering how transactions are actually processed in the network and how does it tie into the blockchain. Transactions are grouped together in a block of data and these are processed approximately every ten minutes by special operators in the network known as miners. Because the blockchain is append-only, each new block is added on to the end forming a chain. Miners put their computational resources to use to add on new blocks to the chain. Hence the derived term “Block Chain”. Why would miners want to put their computational resources to use? Miners who successfully mine a block get rewarded with a special transaction known as a Coinbase transaction in each block. The Coinbase transaction is freshly minted Bitcoin and is currently 12.5 Bitcoin. Miners get rewarded with both this transaction and a cut of the transactions mined. Around every four years, the amount awarded through the Coinbase transaction halves. 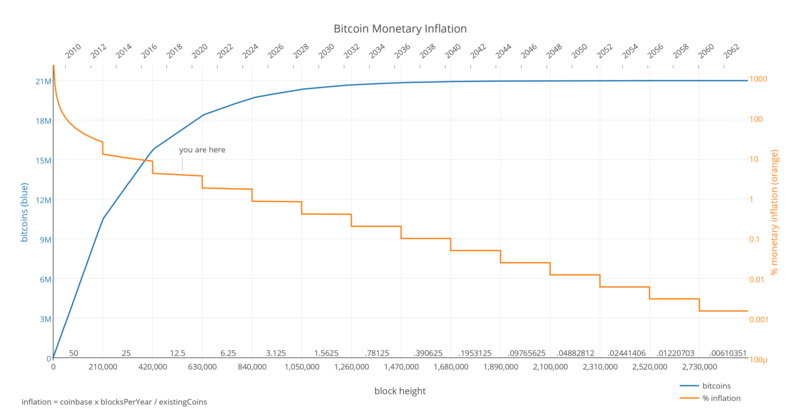 The theory is that Bitcoin will grow more valuable over time (with their being less coming into existence) and miners will take an increasingly larger cut of the transactions processed to compensate. The next halving of the reward is projected to take place in mid-2020. How do miners add on the block? With miners all over the world competing to add on this block, how is it decided which will add it on? Miners compete to solve a cryptographic puzzle which will grant them the right to add the next block on to the blockchain. Miners need to take into account four variables to solve the cryptographic puzzle. The variables are the time, a link to the last block, the transactions to be included in the block, and a random variable called a nonce. If miners are solving the blocks faster than ten minutes, the difficulty to solve the solution will adjust to make it more difficult. If it is taking longer than ten minutes, the difficulty will be adjusted to be easier. The difficulty level adjusts every 2016 blocks which should work out at two weeks if every block is perfectly ten minutes. Because it is so difficult to mine Bitcoin and only one miner finds a block, mining pools are often formed where miners pool their computational resources together and the profits are split between members of the pool. Mining was a hobby activity when Bitcoin was first created with many using the CPU on their computer to mine Bitcoin but it has since turned into an extremely competitive profession. Many large miners are being pushed out of the market as the difficulty to mine continues to increase. Those that continue to mine profitably are those with access to the lowest electricity rates and specially designed hardware for mining known as Application Specific Integrated Circuits (ASICs). Miners play a very important role in the network. They ensure that each transaction is valid by checking the whole ledger to ensure that the user has funds to send. If there are any malicious actors attempting to double spend, they would need to be able to convince all the computers maintaining a copy of the blockchain that their transaction is valid. This is known as a proof-of-work system and is very computationally expensive. The Bitcoin network expends more energy than many large countries annually by applying this system. What Are The Key Things To Know? Now you have a background of Bitcoin, the blockchain, and altcoins. But as you venture into the world of cryptocurrencies, there are some terms which you are bound to come across that may cause some confusion. If not all of these make immediate sense, do not worry as we will go into more detail on these as the chapters progress. An exchange platform is typically an online website where one would visit to buy, sell and trade their EUR, GBP, USD, YEN etc. to cryptocurrency, or else, exchange between different cryptocurrencies. Bitcoin is not the only cryptocurrency, similar to Bitcoin we have Ethereum, Ripple, Litecoin, Ethereum Classic, IOTA and over 2000+ more cryptocurrencies. 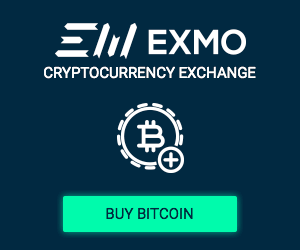 An exchange would typically also support the trading from one cryptocurrency to another. 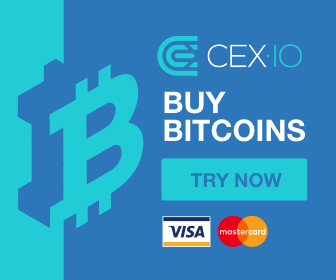 However, not all cryptocurrency exchanges support the purchasing of cryptocurrency with FIAT ($,£,€ etc). To find which exchanges support the purchasing of cryptocurrency with FIAT, they need to support ‘FIAT to Crypto’ trades, while those exchanges which only support ‘Crypto to Crypto’ trades will not have the functionality to purchase crypto with your traditional local currency. For now, you can consider wallets as a place where cryptocurrencies are stored. There are many kinds of wallets including desktop, web-based, mobile, and hardware wallets. The key points to note about a wallet is the private key, the public key, and the recovery seed. Firstly, let’s differentiate between the public key and the private key. You can think of the public key as your email address. You can give your email address to friends and colleagues so that they can contact you. But you would not give them your password. If you gave them your password, they would be able to access your email account and potentially have to access sensitive information. The public key and private key operate in the same way as your email address and email password. Your public key can be distributed so that entities can send you funds. It can a number of forms, typically an alphanumeric string or a QR code. There are also personalized addresses. Your private key is what is used to sign transactions. It enables you to send funds to another address. If your private key is revealed to someone else, they will have access to your funds. Finally, the recovery seed is what is used to recover your wallet in case your device is compromised. If you have your wallet on your desktop or mobile and the device is broken, the recovery seed allows you to recover the wallet on a different device. It typically comes in the form of a string of words. This should be secured with the same importance as the private key as if someone obtains your recovery seed, they can also access your funds by recovering your wallet on another device. Different types of wallets, hardware, software, web-based etc. etc, store your crypto coins in different ways. Hardware wallets store your coins on an actual device which looks like a pendrive, Software wallets store them on your desktop computer and take the form of a file in your desktop. Web-based, store your coins on the cloud (on the web). And last but not least, Mobile or application based, store your coins as an application on your mobile or on your browser, ex. Chrome, apps. Wallets come in a wide variety of forms. Different wallets have different support for cryptocurrencies with many focusing on just one cryptocurrency and others offering a wide variety. Generally speaking, a web-based wallet typically has the lowest security and hardware wallets typically represent the highest security. The term FIAT represents any currency, whether it is Euro (€), Dollar ($), Pounds(£), Yen (¥) or any other traditional coin, which the government controls and declared it to be a legal tender, but is not backed up by a physical asset, such as gold. Any other cryptocurrency that is not Bitcoin. It’s a short term for ‘Alternative Coins’. A cryptocurrency built on top of a blockchain which is typically integrated with a decentralized application and represents a digital or physical asset. So, now that we have a basic understanding of Bitcoin and the technology that it runs on let’s have a look at some of the most significant moments in its history. These prices are an approximation as prices can vary wildly within months and different exchanges list different prices. February 2011 ($1): Bitcoin reaches dollar parity. February 2014 ($550-$750): MtGox suspends withdrawals, files for bankruptcy, and announces hack of 744,000 Bitcoins from users accounts. 2018 ($5800-$17000): Several key political and technological developments. Governments make strides to regulate the industry and developers work on addressing scalability issues with blockchain technology. EOS raises $4 Billion in the largest ICO ever conducted. Price undergoes a prolonged decline which takes it from highs in January to around $6000 at the time of writing. Throughout its lifespan, Bitcoin has been declared dead over 300 times, been labeled a scam constantly, and been called a Ponzi scheme countless times. There is still no idea as to who Satoshi Nakamoto is. There has been much speculation and claims from people in the community, but we are farther than ever from knowing. Many believe this is a good thing as it makes Bitcoin the only truly decentralized cryptocurrency. Other projects look to a leader for the next steps whereas the future direction of Bitcoin has to be deliberated by the community. It didn’t take long before entities began tinkering with the Bitcoin source code to come up with their own projects. Bitcoin has certain calibrations coded in that are extremely unlikely to change. These include the 21 million maximum supply, the Coinbase transaction amount halving every 210,000 blocks, and the network difficulty adjusting every 2016 blocks. This results in a supply schedule approximately like the one below. The curve will vary based on variations in block time. Due to the open-source nature of the project, the Bitcoin network code could be forked and adjusted by anyone who wishes to set up their own network. Some have coded networks from scratch, but many adjusted the Bitcoin network to tailor for their vision of how a network should operate. This has led to the arrival of altcoins. Altcoins are any cryptocurrency that is not Bitcoin. There are over 1,000 altcoins in total that tailor for all sorts of niche needs. Today, many are attempting to apply blockchain technology to business use cases that may benefit from decentralized technology. Here, we will cover some of the largest capitalization and well-known altcoin projects. Litecoin is one of the most successful of the early altcoins created. The project was created in 2011 by Google software engineer Charlie Lee. Lee launched Litecoin in October 2011 and it holds a place in the top ten cryptocurrencies by market capitalisation today. Litecoin made some key changes to the Bitcoin code. Instead of ten-minute blocks, Litecoin operates with 2.5-minute blocks. The mining algorithm used for Bitcoin is SHA-256 whereas Lee changed this to Scrypt for Litecoin in an attempt to make it more accessible to hobbyists. With the 2.5-minute blocks, Lee also changed the maximum supply to 84 million and the halving schedule to occur every 840,000 so that Litecoin would have a similar supply schedule to Bitcoin. However, Litecoin never wanted to overtake Bitcoin. It sees itself as silver to Bitcoin’s gold. With Bitcoin being a more computationally intensive and larger network, it gives more sureties in terms of the security of transactions and the network. However, Litecoin also offers some advantages over Bitcoin with faster transactions and lower fees to use. What happens when the community wants to make a change to a project? A change can be made but the vast majority have to agree. Each project has its own process for how this is governed. In Bitcoin, a Bitcoin Improvement Proposal (BIP), is put forward introducing a proposed change. BIPs undergo scrutiny by the community and if accepted, the code is updated. But sometimes there is a split in the community which results in two different blockchains going ahead. These can result from a soft fork or a hard fork. Bitcoin Cash was the result of a hard fork in the Bitcoin code. It was the result of a lengthy dispute in the community over the separation of some data within blocks (i.e. SegWit). Bitcoin Cash is ranked within the top ten cryptocurrencies by market capitalisation and is a controversial coin within the community. While Bitcoin has a 1MB block size limit, Bitcoin Cash forked to increase this block size. If you are getting confused with the forks, don’t worry about! This is a more advanced concept but the key takeaway point is that altcoins can be forked from existing cryptocurrencies especially if there is a dispute in what rules the network should operate by. Ethereum underwent a phenomenal price rise in 2017 that took it from a valuation of around $0.08 to above $1,400. It has claimed its spot as the number two ranked cryptocurrency by market capitalization and has held it for a considerable amount of time. Ethereum is an altcoin which fundamentally differs from the previous two as it is not strictly about the transfer of value. Ethereum aims to be a world computer and bring blockchain technology to be more than money. The Ethereum Virtual Machine (EVM) runs on top of a decentralized blockchain architecture which has the proof-of-work consensus systems. Developers can build a decentralized application on top of the EVM. It can be used to develop smart contracts which will be detailed later in this chapter. Some of the use cases which the EVM is being applied for is decentralized exchanges, smart contract generation, and the tethering of assets. Tethering of assets has sparked a fundraising evolution with many cryptocurrencies (tokens) which are native to the Ethereum blockchain being issued and representing real-world physical assets. There is also the generation of tokens on the Ethereum blockchain to represent digital assets. One of the most well-known examples of a decentralized application which used tokens is Cryptokitties where users own a token which represents a unique breed of digital cat. Cryptokitties almost crashed the Ethereum network in 2019 making huge demands on its transactions. Dogecoin is an interesting altcoin that was started as a joke but found a use case as a tipping coin. It was developed in 2013 and the idea originated from a popular meme of doge, the Shiba Inu dog. The actual origination of the coin comes from a tweet by Jackson Palmer who was working in the marketing department of Adobe. The tweet was intended as a joke about the increasing interest in cryptocurrencies, but it caught the attention of a developer called Billy Markus who put the idea into reality. The coin was forked from Litecoin. The coin reached 100 Billion in supply in around 1.5 years after launching and issues 5 Billion dogecoins per year. The coin has found a strong use case as a tipping coin and also has a strong community behind which have raised substantial amounts for a number of charities. The mainnet refers to the main blockchain of the project. If you hear that a mainnet launch is upcoming, it means that the project is launching its own blockchain network on the date specified. The network needs to undergo testing and debugging prior to properly launching. Smart contracts are autonomous coded contracts that operate on code when certain conditions are met. An example of a smart contract could be if Jill’s account drops below €50, then smart contract sends the amount of €100 to Jill’s account. This refers to an initial coin offering. We will cover this in greater detail in a later chapter. It is a cryptocurrency fundraising event that a project completes whereby the team issues tokens in a cryptocurrency exchange for funds. The tokens are typically in some way linked to the project. A computer which maintains the state of the network. A special type of node that put their computational resources to work to compete to append blocks to the blockchain. A measure of the computing power which a miner is applying to the network. The cumulative hash power is used as a measure for the security of the network. We will cover hash power in further detail in chapters five and six. A consensus mechanism for a blockchain network where every node maintains the state of the network. Miners compete to append blocks to the chain by putting their computational resources to use to validate transactions by checking signatures on transactions and fund balances. A special type of node that operates in a different consensus mechanism model than proof-of-work. This node gets a dividend to append blocks to the blockchain but will lose its balance if it approves invalid transactions. This will be covered in more detail in chapter six. Consensus system whereby masternodes append blocks to the blockchain. This will be covered in more detail in chapter six. A software change that restricts the ruleset e.g. decreasing maximum block size from 1 MB to 500KB. A software upgrade that loosens the ruleset e.g. increasing the maximum block size from 1 MB to 2 MB. With cryptocurrencies being a risky space where many have lost investments through either poor allocation or from being scammed, there are certain things which you should do and avoid doing. We will go into more details on the typical type of scams that are encountered in chapter four but the list below has some key do’s and don’ts to get you started. Once you’re ready, proceed to chapter 2.